It was your favorite record. The last bite of lasagna. Or 3 years of your life. You gave it to her and don’t regret it for a second. Though the relationship didn’t last, you aren’t burned out on giving the best you have to the person you love because when it’s all boiled down, that’s what you’re supposed to do. Maybe it didn’t work out because she wasn’t doing the same for you. Maybe she isn’t the dream girl you remember her being or maybe you messed up and lost her. But don’t mess up by treating your future relationships with a cynical attitude. Because the next one may be the reason all the past ones are the past ones. It was a normal, typical, forgettable day when I started looking for a stamp to mail my water bill. 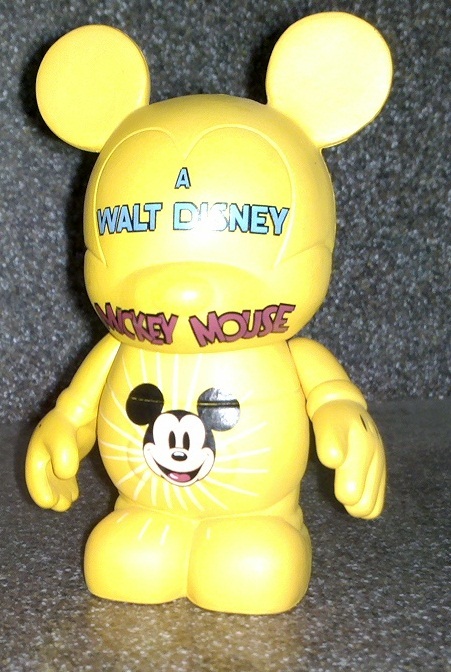 I came across a silly little Disney Vinylmation figurine that reminded me of a girl I once dated. You see, there were 2 figurines when I first returned from a summer trip to Disney World in Florida. I bought one for me and one for her. With the collection of these designer figurines, Disney was creating some mystery by selling them without the buyer knowing which one they were getting (they were packed in a black cardboard box). In theory (and a whole bunch of spending later), you could own the whole set! Go you! After we opened them up, there was clearly a “cool” one and clearly an “ugly” one. I knew which one she wanted so I kept… this one: Yeah, clearly the lamest. But I didn’t care. I wanted her to have the best one. Do I regret keeping this one? Ehhh, maybe. Do I regret selling it online? No way. Hey, I’m sure somebody wants it (and if that somebody is you, eBay). I never found the stamps but in a moment of nostalgia, I found out that whether it was gifts, time, or revealing the deeper things in my heart, I don’t regret anything I gave that girl and I don’t regret our relationship ending, either. That was meant to be, and giving the best of who I am is what I’m meant to do. My creativity, my time, my trust, what I cherish the most which could be my family, my dogs, keys to my house, or telling someone something no one else knows, I’ll give it all away. I won’t stop giving my best to whoever I’m dating at the time. Because that girl may turn into my girlfriend. She may turn into my wife. She may turn into the mom of my kids and a grandma to their kids. And one day as we’re looking through old photos of our family, I’ll realize somewhere along the line as I was giving her the best I had to offer, we actually gave the world the best we had to offer… and we’re looking at pictures that prove it. This entry was posted in Dating / Relationships, Relationships, Seasons, Society and tagged Disney World, Mickey Mouse by Ben Wilder. Bookmark the permalink.